Getting your survey invitation into the recipients’ inbox is vital yet a lot of organisations don’t think about the deliverability of their emails. According to ReturnPath 20% of emails are not delivered. Mail servers and email filters block the email before it reaches the inbox of the intended recipient. Ultimately, if your intended survey respondent doesn’t see your survey invitation, there is zero chance of them completing your survey. Not good. 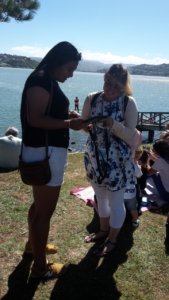 A classic example of this problem is the email we received from the Research Association of New Zealand (RANZ) and the catalyst for this blog. The email is a reminder email with a call to action, namely to take a survey. This was filtered into the junk mailbox and you can see it has a warning that the message appears to be junk mail. Many people never check their junk folder and in this case, it was good luck that we spotted it. What can be done to improve the deliverability of your survey invitations? ISPs have a blacklist of IP addresses which they have decided do not have access to their servers. When you send an email it is uploaded to a mail server and then relayed across other networks and servers using Simple Mail Transfer Protocol (STMP). Every email includes the IP address of the sender and if a service provider receives too many complaints in relation to an IP address or notices an excessive amount of traffic coming from an IP address they block the IP from accessing their Mail Servers. This is done to counter spammers. To avoid being blocked by an ISP it is good practice to use organic email lists instead of lists you have rented or purchased. ISPs use algorithms and anti-spam companies to filter out what appears to be spam based on the content of an email. The algorithms look for patterns based on words or phrases within the email. The domain address of the email is also considered. If your email has a professional look and feel to it and has engaging content it will more likely pass through content filters. It is advised that one should not use link shorteners in an email. Link shorteners are often used by spammers to hide malicious links and are a red flag to ISPs. Just like your business has a reputation so does your IP address. Each IP address has a sender score between 0 and 100 which based on your reputation. A good reputation is a sender score over 80 and your emails are likely to be delivered into the inbox while a sender score below 70 is likely to have their emails filtered and are likely to end up in the junk folder. There is a range of factors that affect the reputation of your IP address but the key one is how people interact with your emails, ISPs track a number of behaviours. If an individual opens, reads or clicks on your email the ISP knows that the person wants to receive messages from you and this builds a positive reputation. On the other hand, ISPs note the number of unsubscribes or spam reports. Too many of these can damage your reputation and lead to your emails being delivered to the junk folder or filtered out. Spam reports and complaints have the strongest negative impact on your reputation. Acceptable spam report rates vary by provider, however, an industry standard for email campaigns is 0.01%. If your complaint rate goes above the acceptable level according to your provider access to the email service may be suspended. Other behaviours ISPs track includes how often your emails are deleted without being opened, the number of times an email is moved to another folder or forwarded on to someone. An open rate of 20-40% in an email campaign is considered good as is a unsubscribe rate below 2%. Bounced emails from invalid or non-existent email addresses can also damage the reputation of your IP address. Care must be taken during the recruitment phase of an email campaign to ensure that email addresses are entered correctly. Best practice is to send an opt-in or confirmation email after someone has signed up. Sending a follow-up email confirms that the email address is valid, it is used by the person who signed up and that they do want to receive emails from you. Over time people change their email provider and many don’t close their previous email account instead just abandon it. 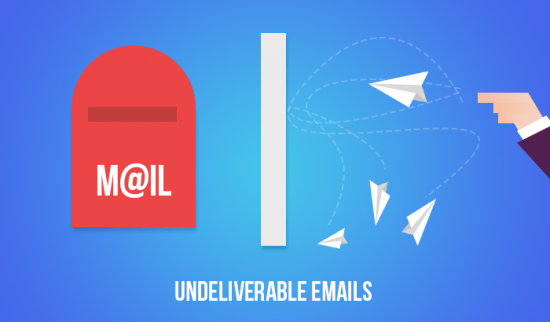 An abandoned email address can bounce back as the inbox fills up and may become invalid. It is good practice to remove bounced emails from your list as you undertake campaigns, in fact,most email campaign programs do this automatically. So why was the RANZ email filtered to the junk folder? 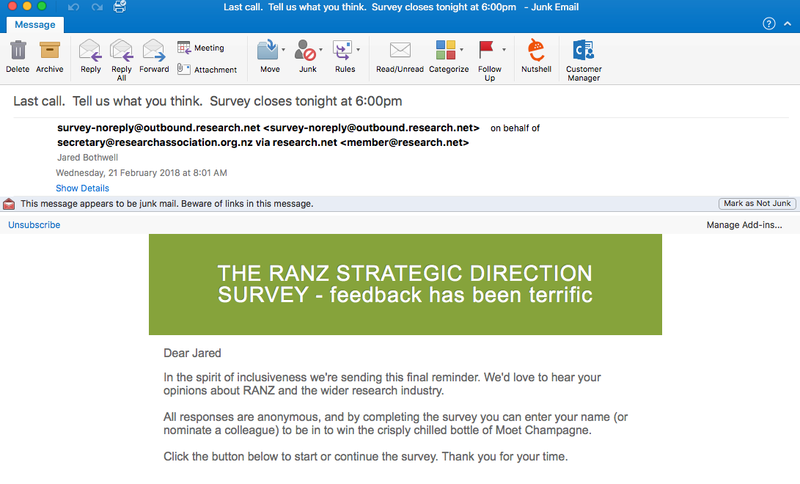 The RANZ survey was carried using SurveyMonkey which is a common survey tool used by many. The issue is that while these platforms are great at doing surveys you are sharing the domain and IP address of others who use the survey platform. While SurveyMonkey has an Anti-Spam Policy and zero-tolerance to spam, the behaviour of other users of SurveyMonkey has affected the sender score. To maintain and protect the reputation of our clients and get a better delivery rate we have measures in place including custom domains and custom IP addresses.